Summer has finally arrived in California. One day it was freezing cold (as in there's still snow on the ground in some spots), the next it was in the 80s and now everyone is complaining and cranking up the AC. But just because it's a scorching summer and I don't have artificially cold air in my home (I live by an ocean, naturally cold air! ), doesn't mean I won't turn on the oven and roast poor defenseless vegetables. Because roasted vegetables are so much yummier than raw ones (especially cauliflower, regular and Roman). 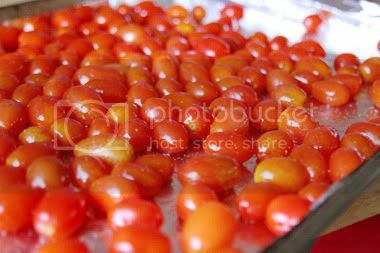 So it was without even a second thought that when Erika Kerekes posted her oven-roasted cherry tomatoes recipe on Facebook, that I walked right into my kitchen and followed her directions. Luckily I had just picked up 2 baskets of grape tomatoes. First I laid them all out on a pan, and rubbed them lovingly with olive oil and Adobo seasoning. They enjoyed it. 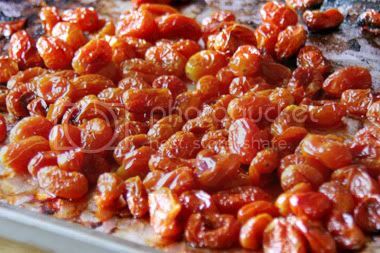 Then I roasted them till they shriveled up into little tomato raisins. Like Erika will tell you, "they get redder, softer, juicier." And sweeter. I've put them in every single salad I've had this week (and I eat one for lunch every day), the spaghetti I made last night, and even stood over the pan above and just ate them straight out of the oven. Until I burned my tongue and managed to hold off for a while, till they cooled an edible temperature. Throw them in a jar and dare yourself not to eat them all at once. Erika's recipe can be found here. Though I would recommend doing this early in the morning or late in the evening, especially if you don't live by an ocean. Tomato raisins! (You must have let yours go a little longer than mine.) Delicious, aren't they? I keep thinking of new reasons to make them...put them into tomato soup sometime and you'll see what I mean. I love erika's recipes and I loooove tomatoes! I have made ones similar to these but by pan-frying them (they don't get quite so shriveled but still sweet). Yay for summer! @Erika: no just an hour but my oven runs hot roasted tomato soup sounds divine. @Clantropist: pan frying is certainly faster and heats the house less. I wonder if anyone has done them in a slow cooker.